For more than two decades now, we've been designing and building structurally tough and aesthetically pleasing retaining walls for property owners in Crown Point, DeMotte, Schererville, St. John and Valparaiso, IN. Our company became known for our gorgeous wall designs, our reliable installation that always ensures topnotch results, and our highly competitive pricing that is truly easy on the client’s budget. Simply put, we can offer you the best value for your money when you avail our services soon. Since the main purpose of retaining walls is to improve safety in an area, we always ensure the exceptional quality of our installation. There are cases when uncontained loose soil could give in and erode, which can pose danger to people around the area. Erosion can also damage structures in a property. Aside from safety, a nicely built retaining wall improves the functionality of an area by turning an otherwise unused spot into a place of lasting beauty. In fact, we have created countless walls that have doubled the aesthetic appeal of the property we’ve installed them into. And when built by professionals like us, retaining walls can actually increase a property’s market value since buyers are willing to pay extra money for such outdoor features. So with all these great benefits, it’s just right that these amenities be built using premium retaining wall blocks and installed by expert crews like the ones we have at Rob Rocks Inc.
One of the great things about us is that we can achieve various designs or themes that clients fancy. We have such trusted partners like Belgard that supplies us with top-quality materials. 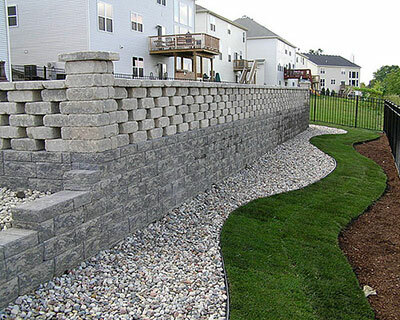 Our partnerships with leading manufacturers help us create world-class retaining walls for our valued clients in Crown Point and nearby Indiana areas. BelAir Wall. For those who want a not-so-typical look that is characteristic of traditional walls, BelAir Wall is the perfect option. It has a visually appealing multi-piece configuration that comes in blended colors for a truly seamless look. You may choose from Montecito, Sunset Brown, Toscana, Santa Barbara, and Victorian. Celtik Wall. If you fancy natural beauty and time-honed appearance, then go for Celtik Wall. Its antiqued look is coveted by so many property owners who want to go back in time through their retaining walls. Diamond Pro. Engineers, contractors, and architects prefer Diamond Pro when tasked to build large walls for their clients. The beauty of this product line is that it is cost-effective, versatile, and specifically manufactured to be stacked high and wide, hence providing safety to large areas. Highland Stone. This product line features a rear-lip locator that allows for quick installation and six-inch system that lets builders achieve different designs. While we can just use any retaining wall blocks for our installation projects, we specifically choose the segmental type for some great reasons. First is that it is easier to install and requires no extensive digging and use of mortar, which could delay the process and add up to the cost. It’s also easy to achieve different themes or designs, given the design flexibility of the segmental wall blocks. Additionally, they are extremely durable and have a high tolerance to soil movement. Call us soon and let us show you why we’re the best installers of retaining walls in Crown Point, IN and nearby cities.